My deepest condolences to you and to your family. My heart and my feelings are with you. I pray that god gives you the strength to pass through these difficult times [as he gave it to me before]. You should know that I’m here for you. We extend our most sincere condolences to you and your family. We are praying for you during this sad time and wish your beloved peace and serenity. I feel for your loss and want extend my deepest sincere condolences. We all get through but we never forget. Please stay strong and always remember that we are all here for you. Please accept our sincere condolences on the passing of your mother. We sympathize with you and feel your pain. May god be with you during these difficult times. I am terribly sorry to hear about the passing of [your father]. I ask god to bring peace upon his soul and give you the strength to survive this painful moment. I am here for you. 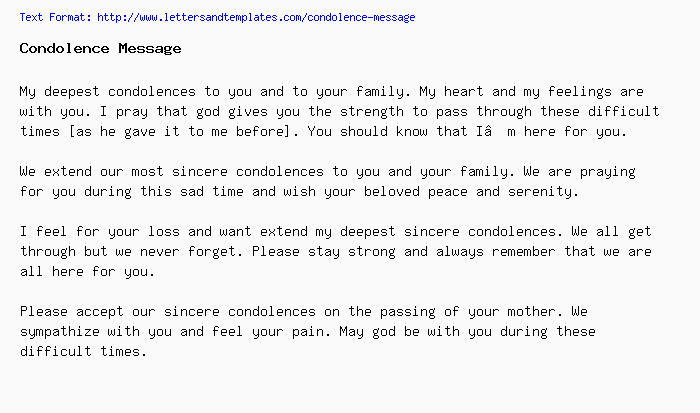 Please accept our most sincere condolences on the passing of your [father]. It is never easy to lose someone, but we accept and cope with god’s will and ask for the strength to carry on. May his merry soul rest in peace. I am deeply pained by your [father’s] death. He was such a wonderful and loved person. This is a big loss for all of us. We feel your pain and stand by you in these difficult times. If there is anything that we can do, please don’t hesitate to ask.